For me, there is nothing more comforting than a warm cozy bedroom at the end of a long hard day. I want a place to relax, to read, and to fall asleep knowing there will be sweet dreams. 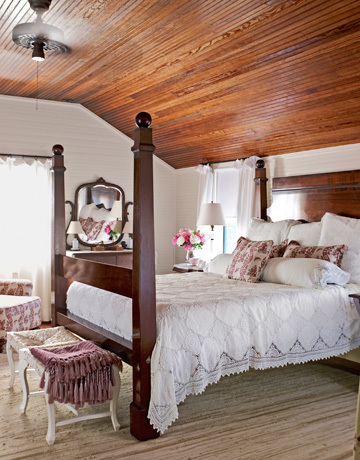 I think country farmhouse bedrooms really create that feel. I love the wood ceiling in this room, along with the big four poster bed, and a comfy throw rug to warm your toes in the morning. This looks like a cozy spot, with its old brass bed, down comforter, and soft lighting. A yummy cast iron bed. I love the combination of vintage textiles and the painted bench in this room. Beautiful bright quilts, white bead board walls, and baskets tucked under the bed give this small space a light airy feel. I love the simplicity of Shaker style furniture and the faux fireplace gives an added cozy touch. I would place some candles in front of the fireplace to give the illusion of a warm fire. Those beautiful images made me sleepy, love the last picture, so primitive, love it! Great pics! I especially like the one with the patchwork quilt. I guess I would have to go with the bright quilts and baskets. Although, I do love the 4-poster bed and wood ceiling. thanks for dropping by my blog Sakura Haruka. Am following you on GFC now :) lovely pics btw! Def. my style here. I'm lately "into" small so was really interested in the tiny room...but all bring a sigh to my heart. Beautiful pictures of beautiful bedrooms. I'm loving your style. PS Thank you for becoming a follower of my blog. I hope you enjoy your visits. I'll pop over to your shops sometime. I love every single one of these bedrooms. I think the bedding in the last photo is *to die for* and the wood on the ceiling in the first one is pretty, too. Lovely post!